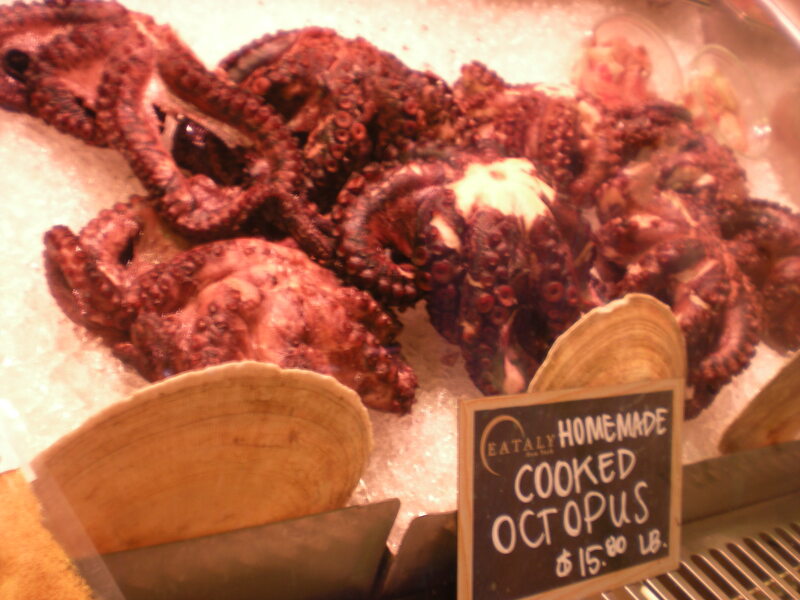 First of all, anyone who follows this blog regularly will realize that this is one of only about two seafood posts here. 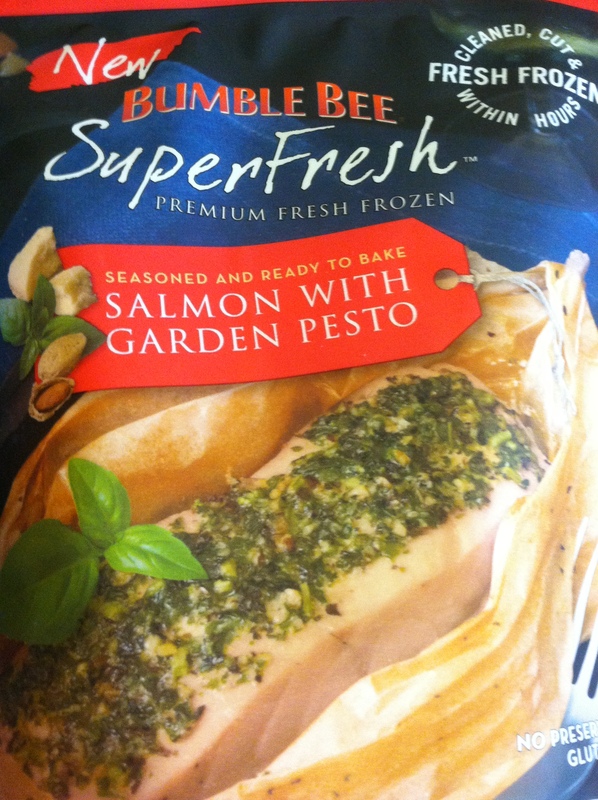 It’s no secret I’m not a big fish eater, so when Bumble Bee® offered to send me samples of their new Bumble Bee SuperFresh™ frozen seafood line, I was hesitant. 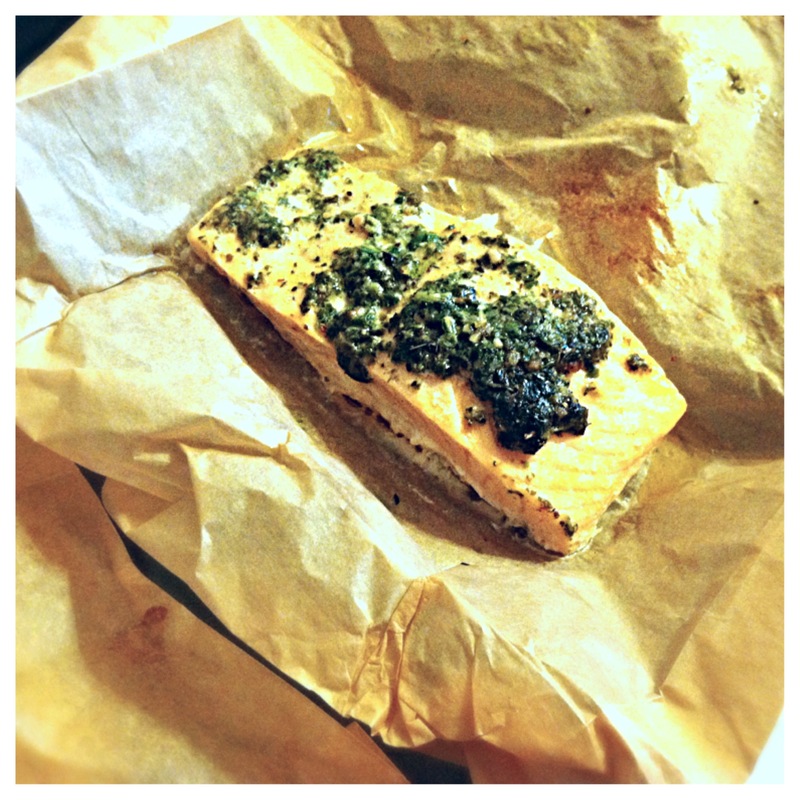 But I took it on, because one, I love to try new things and I’m trying to branch out into the world of (so insanely good-for-you) fish, and two, because it was another review opportunity, and a chance to mix up my blog content. My favorite thing about this line is the ingredient list. Each product contains only a handful of ingredients and absolutely zero preservatives or sketchy chemicals. The ingredients read like recipes you’d make in your own kitchen, frozen into handy packets for your convenience. Thanks to that, the nutrition stats are pretty solid. 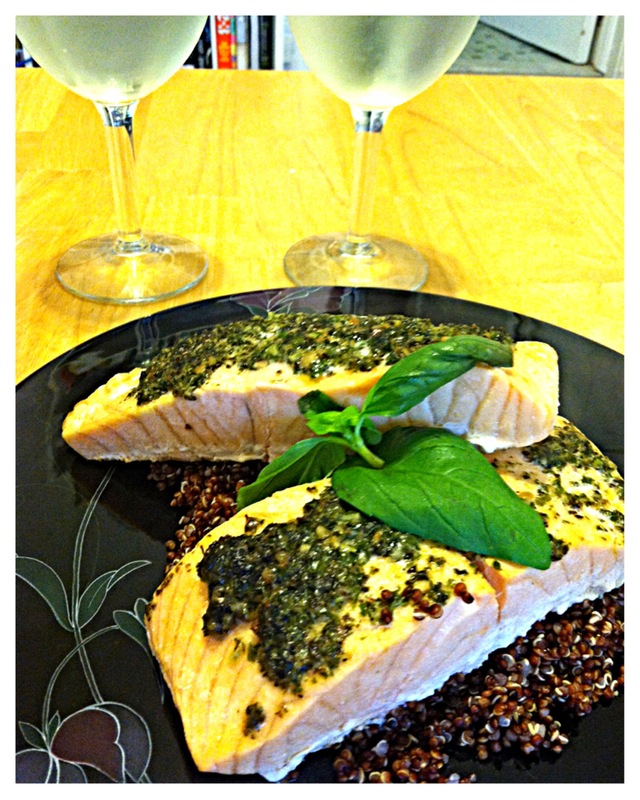 The ingredient list on the Garden Pesto Salmon, for instance, is: Extra Virgin Olive Oil, basil, Parmesan cheese, almonds, parsley, fresh garlic, black pepper. Each filet (there are two per package) has 230 calories, 11g of fat, 40 mg of cholesterol, 170 mg of sodium and 26g of protein. It also has 0g of sugar, 0g of trans fat and is gluten-free. Convenient, quick and full of natural ingredients…can’t beat that, really. And these really take very little time to prepare. 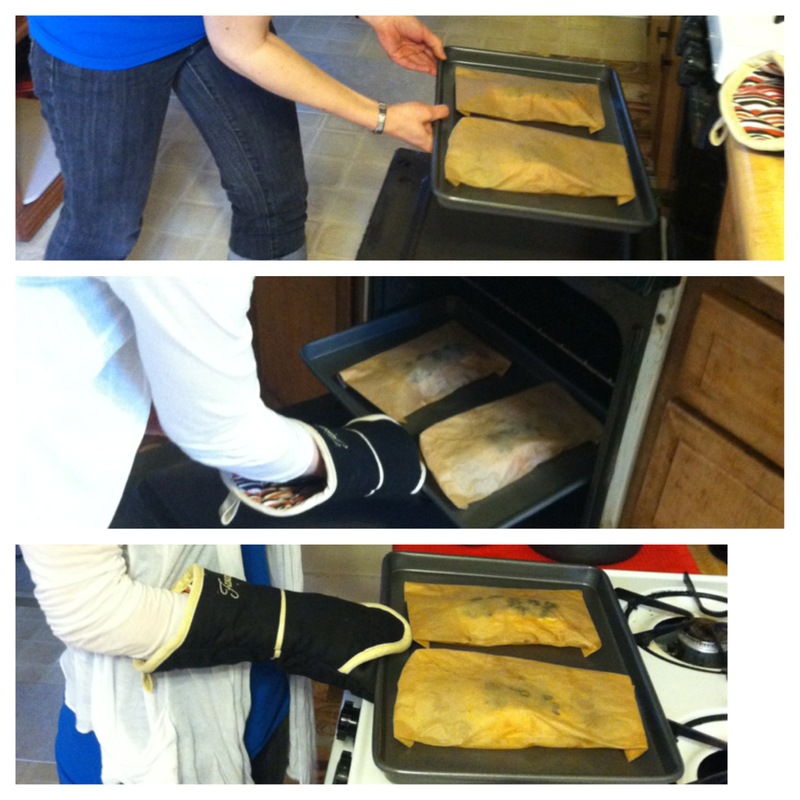 The salmon takes 20 minutes in a 400-degree oven. The shrimp only takes about 6 minutes on the stove. That’s about as quick and convenient as you can get. 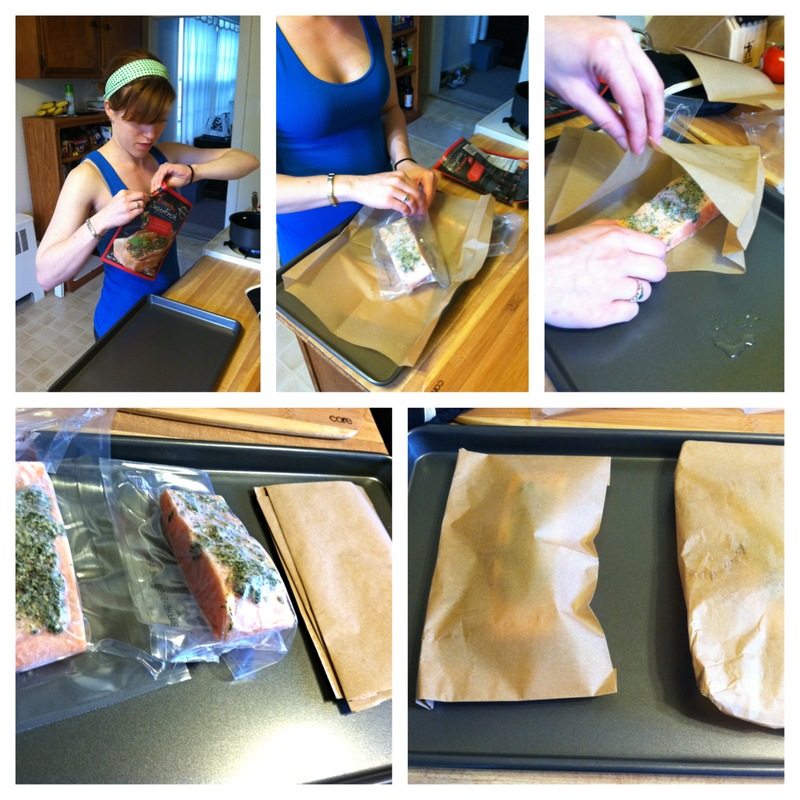 And the tilapia and salmon come with their own parchment packets, so there’s virtually no clean up. You just open the sealed packet with the filets, pop each one in its individual parchment, place on a baking sheet and bake. The shrimp has to cook in a pan on the stove, but you’re still only left with a pan and maybe a utensil or two to clean when all is said and done. They come with their own butter and seasoning medallions, so you just cook the shrimp in the pan, add the included seasoning and stir to coat. So, obviously, the big question now is, “How was it?” Well, to be perfectly honest…I still don’t like salmon. But that doesn’t mean this product was no good. The two filets cooked up perfectly in 20 minutes in the parchment and came out soft, flaky and steaming. The pesto seasoning was absolutely delicious (almost as good as my own, dare I say–and they even use parsley and almonds in their pesto like I do!). I only picked at it because clearly I’m not going to be embracing salmon anytime soon, but Kevin really enjoyed it and nearly finished his. He only stopped because he was full. I served it over red quinoa, but this would be wonderful with rice, greens or tossed into a salad. The texture, color and consistency of the fish seemed dead-on and it didn’t taste frozen or dried out, which is what I so often worry about with frozen entrees. This tasted like someone prepared it in their own kitchen, flash-froze it and shipped it to my door. 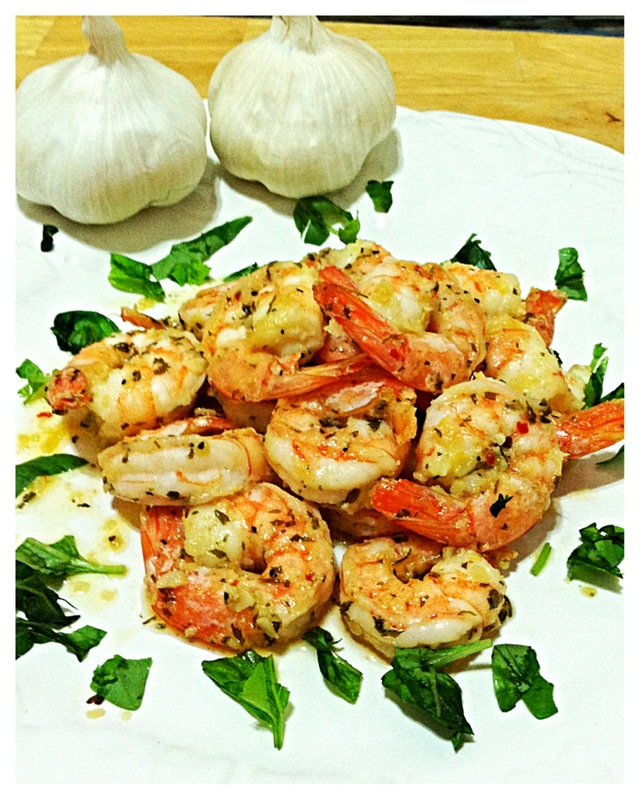 I’ll admit, I’ve actually already worked through two of the Bumble Bee SuperFresh™samples I received–I also cooked up the Lemon Shrimp with Garlic and Herbs. While I’m not a big seafood eater, I am a shrimp fan, and these were oh-my-goodness delicious! I ate them on their own because I made them late on a weekend night and Kevin and I split them as more of a small meal/big snack than a full dinner, but these would be amazing tossed in some angel hair or linguini pasta. I’m actually going to be on the lookout for this one in stores so I can buy it again and try that–like a super-quick shrimp scampi. Seriously, though, between the two of us, the dozen or so shrimp were gone in under 10 minutes. I can’t wait to try the Spicy Shrimp Romesco! Overall, I think Bumble Bee® has a really great product here. It’s a great way to introduce people like me, who don’t know much about preparing or serving seafood, to the world of seafood with completely seasoned and prepared recipes. It’s also great for anyone who needs convenience in their life (don’t we all) but who doesn’t want to sacrifice health or flavor. I’d gladly serve these to others in a heartbeat without feeling embarrassed about serving frozen food at a dinner party. I’m willing to bet that if I served these to someone and didn’t tell them they were pre-made and frozen, they’d never know. The Bumble Bee SuperFresh™ web site has a “Where to Buy” link (http://bumblebeesuperfresh.com/buy) where you can enter your zip code and find out what stores in your area carry the Bumble Bee SuperFresh™ line. Bumble Bee SuperFresh™ is available throughout the northeast. In my area, all the local Wegmans, ShopRites and Stop n Shops carry them. They retail for between $8.99 and $9.99. Definitely not bad for a seafood dinner for two! I’d definitely buy these again, especially the shrimp, and I’d recommend them to my friends and family who are looking for a quick, non-hassle way to prepare fresh-tasting, flavorful, nutritious seafood dishes. *Note: This is a sponsored review BumbleBee SuperFresh™ I was provided with samples of the product to try at home and was paid to blog about my experience. However, all opinions, photos and text are my own. No, no, no. This is a whole new kind of lasagna–a white lasagna, if you will (as in, no tomato sauce), and it is the brainchild of Sylvia Fountaine from Feasting At Home. 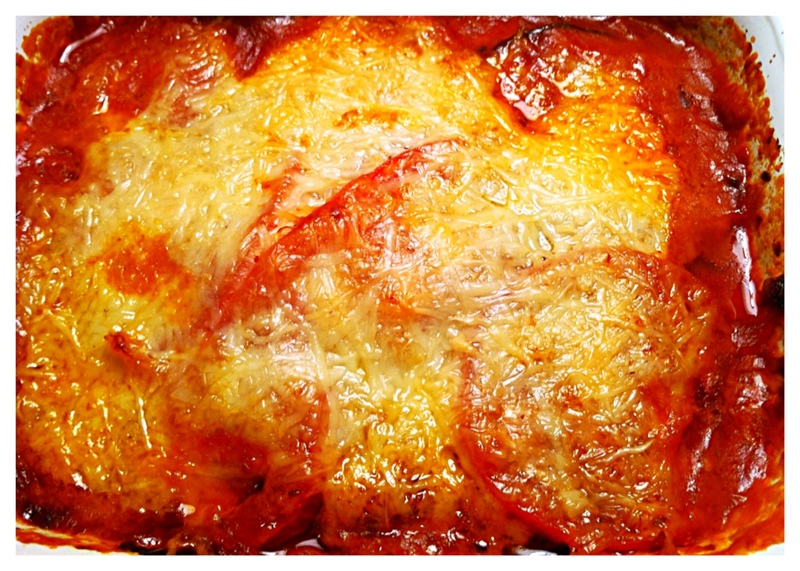 I’ll admit it: I did something a little bad with this lasagna–I used no-boil packaged noodles. No, I didn’t use fresh pasta or even eggroll wrappers like she suggested. I went totally cheat-route and used the no-boil lasagna noodles. It resulted in a few crispy edges, but in the end it worked out. I actually prepped this lasagna Sunday night and left it wrapped in the fridge, unbaked until Monday evening, when I pulled it out and baked it off. This was a great make-ahead recipe that I otherwise wouldn’t have had the time to pull off on a weeknight. 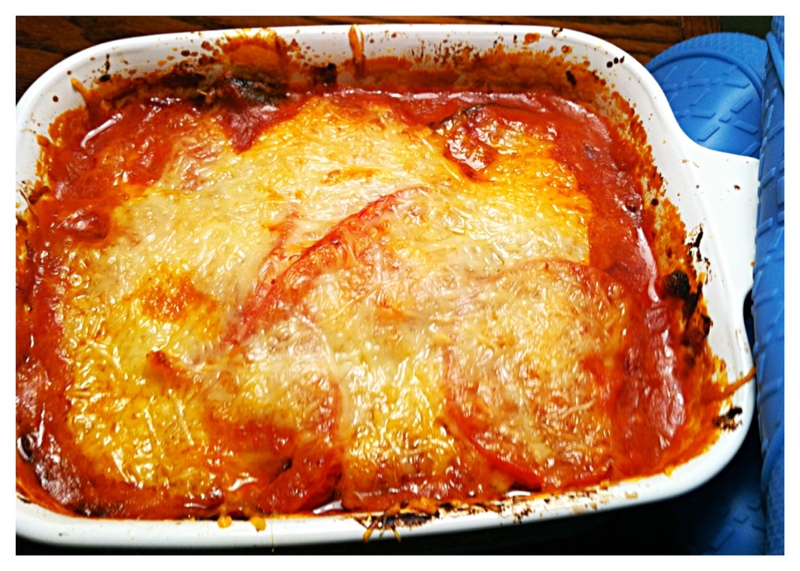 No news here–I halved this recipe (this is pretty much becoming the norm now.) I also added more chicken in place of the mushrooms, because the thought of handling and eating them still totally grosses me out. (I know I said I’d keep the substitutions to a minimum, but this one’s just too deep-seated.) Because the mushrooms release juice when they cook, which keeps the vegetables moist and helps wilt the spinach, I added a splash of white wine in their place to keep the necessary liquid. I also used skim milk in place of whole milk in the béchamel sauce because I forgot to buy whole milk. Shhh…if I didn’t tell you, you’d probably never know! At first, I was a little…confounded by this dish. Like I said, there were some crispy noodle edges, which freaked me out at first (I thought it was undercooked), then my initial bites told me it was bland, and I wanted to sprinkle salt over the whole thing, which I never do. But by my second helping, my taste buds changed their mind, and I added no salt. And by the next day, as I was eating leftover lasagna at my desk, I realized between the cheese sauce, the cooked noodles, and the crispy edges, this lasagna was totally reminiscent of a savory noodle kugel. Be still my Jewish heart. 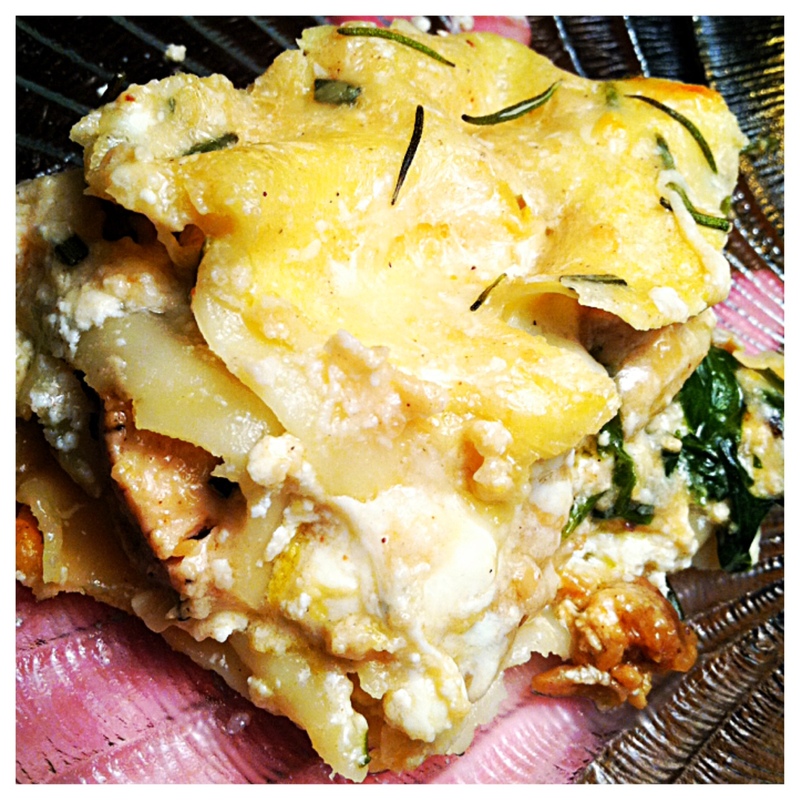 That solidified it for me–this was one good lasagna. This was another minor victory by way of Kevin: the actual Italian boy NEVER eats lasagna because he hates ricotta cheese. (Seriously, what kind of Italian is he??) But he ate this! A whole serving, and he even finished it! Granted, he opted to raid my fridge for the rest of his meal rather than have seconds, but I’ll take what I can get. This one’s for my mama. “Gluten-free” anything often seems daunting to me, but this recipe (from Gluten-Free Girl, natch ) just makes so much sense. Fry the eggplant without breading it first. Duh. (Also makes for a healthier fried eggplant.) This is also vegetarian, though definitely not vegan. So. Much. Cheese. YES! Anyway, this recipe’s pretty great on its own, I just halved it, as per usual. Mainly because I rarely have 4-8 people to feed. This recipe probably would have been even better if 1) my knife skills were better (i.e., actually cutting the eggplant into 1-inch slices, not some 1-inch slices, some 1/2-inch slices and some choppy pieces because the whole slicing thing wasn’t working out so well) and 2) I baked it in a shallower dish. Because I halved the quantity, a 9×13 baking dish seemed way too large for my meager eggplant, so I stacked in all in a small but deep casserole dish instead. It was a little…mushy. One of the two aforementioned things is likely to blame. Nonetheless, it tasted good. Fried eggplant, even on its own, is pretty tasty. It made a good cooking snack. (Maybe eggplant chips will be the new “it” thing! Hey, a girl can dream.) My mom gave it a passing grade and especially like the less-common addition of the sautéed peppers and onions for a little flavor and bite. And the cheese. All the cheese. That alone makes up for any perceived imperfections. Oh, and again my apartment smelled terrific. I really hope I’m making my neighbors jealous. Sometimes I try new things and they don’t always work. Sometimes that means utter, throw it in the trash failure, and sometimes that means it came out okay, but not great. This is a story of the latter. I had seen this recipe for white bean mac and cheese a while back and decided to tackle something similar. I was craving the ooey-gooeyness of mac and cheese but didn’t want to go completely off track, health-wise, so this seemed like the perfect compromise. I didn’t have a whole lot of any one kind of cheese in my fridge, but I had a lot of different kinds of cheese, so I just ran with it. At the time, I though using about a tablespoon of cottage cheese would be a good idea to help get a creamy consistency. Unfortunately, I learned the hard way that cottage cheese doesn’t really melt. It stays kind of chunky and clumpy, which is sort of off-putting in a cheese sauce. So, if I were to attempt this again (and I plan to! ), I’d probably go with a tablespoon of cream cheese over the cottage cheese to ensure that creaminess is there. So, yes, the final product was a bit too garlicky for my taste, and sort of a strange, overcooked garlic flavor. Also, I was probably a bit overzealous in my use of the white bean puree–I didn’t mind it, but the sauce was a bit grittier than a normal cheese sauce from the beans. If you want to hide the white beans and get more of a traditionally smooth cheese sauce, go with less puree. But, still, I could see the real potential in this dish, and so I still want to share it with you, with some adaptations to the recipe based on what I learned. 1. Boil the pasta in a large saucepan with a tablespoon of olive oil to prevent sticking. When the pasta is cooked al dente, drain and set aside. While the pasta boils, puree the white beans with a little bit of water or oil, if necessary, to get a smooth consistency. 3. Add the butter, let it melt, and mix in the flour to create a roux. 4. Once incorporated, add the milk and let it simmer and heat through. Add the cream cheese and stir it into the milk sauce until it melts. 5. Add the white bean puree, 1 tablespoon at a time, and stir to incorporate into the sauce. 7. Add a few sprinkles of mustard and paprika, to taste. Grind in the black pepper, to taste. 8. When the sauce is smooth and reaches the desired consistency, add the pasta back to the pot and stir well to coat. Add more seasonings, if necessary. 9. Turn the oven on to Broil. Pour the macaroni and cheese into a baking dish or into individual ramekins and top with more grated Parmesan and paprika. 10. 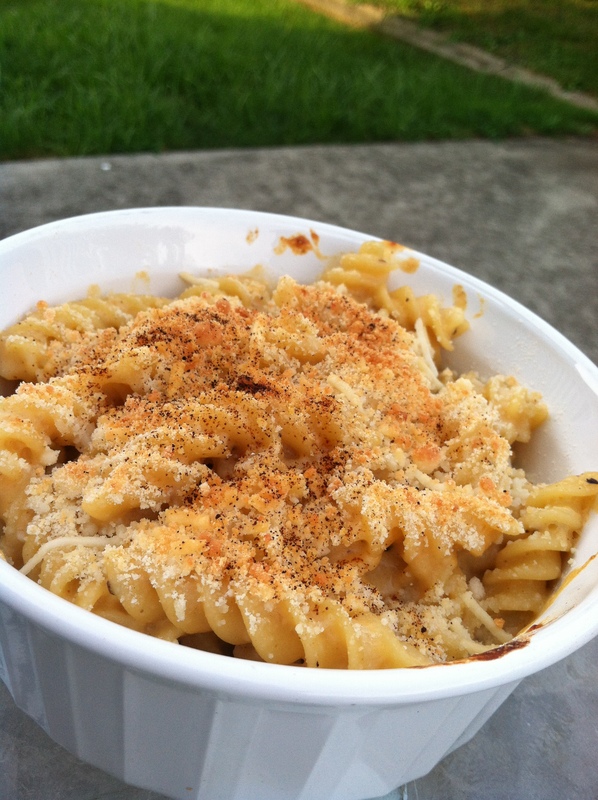 Broil macaroni and cheese for 3-8 minutes or until the Parmesan topping begins to bubble. Remove and let cool for a few minutes before serving. 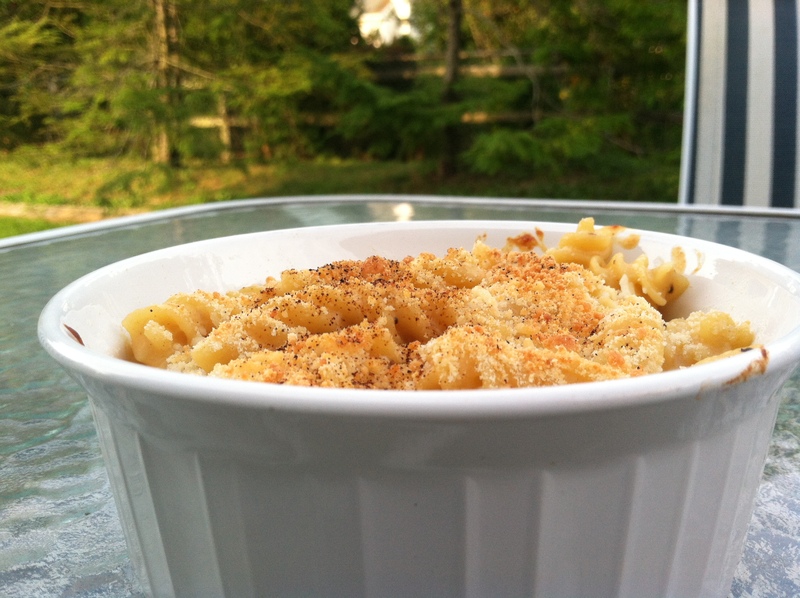 This recipe is great to just lighten up and healthify regular mac and cheese, but it’s also great for kids! You can sneak this white bean puree into their favorite dish and they won’t even know it’s there! Instant fiber, protein and vitamins–and they’re not the wiser! Ha! 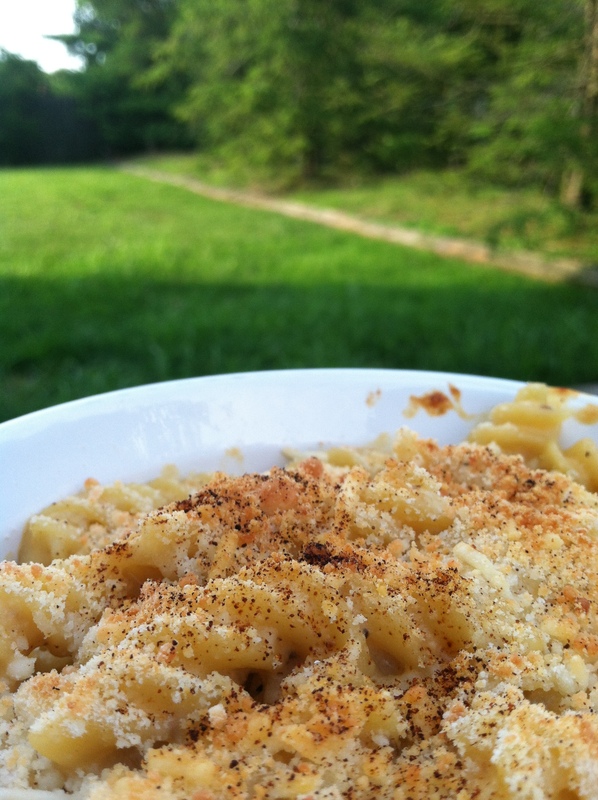 This is also a great no-bake cheat to still create that baked macaroni and cheese flavor. The Parmesan topping gets nice and crispy while the pasta inside stays super creamy and cheesy. I’ve never made a baked-style mac and cheese before–I’ve always made it with a cheese sauce and let it be, like a homemade version of the boxed stuff. 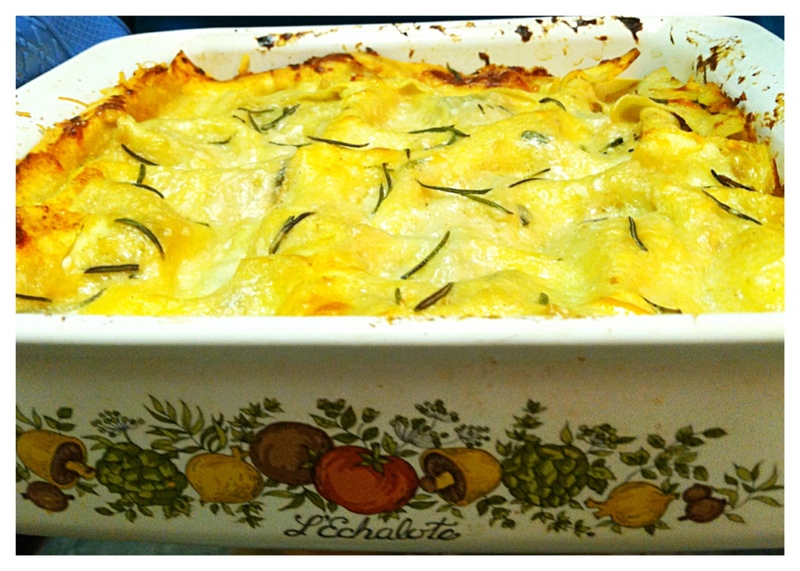 But this time around, I wanted to try that baked casserole-style without actually baking it. Broiling it for a few minutes was a quick way to achieve that without actually sitting around and waiting for it to bake. (Cause I’m hungry!) And you know what? Yes, the burned garlic was a bit overwhelming. 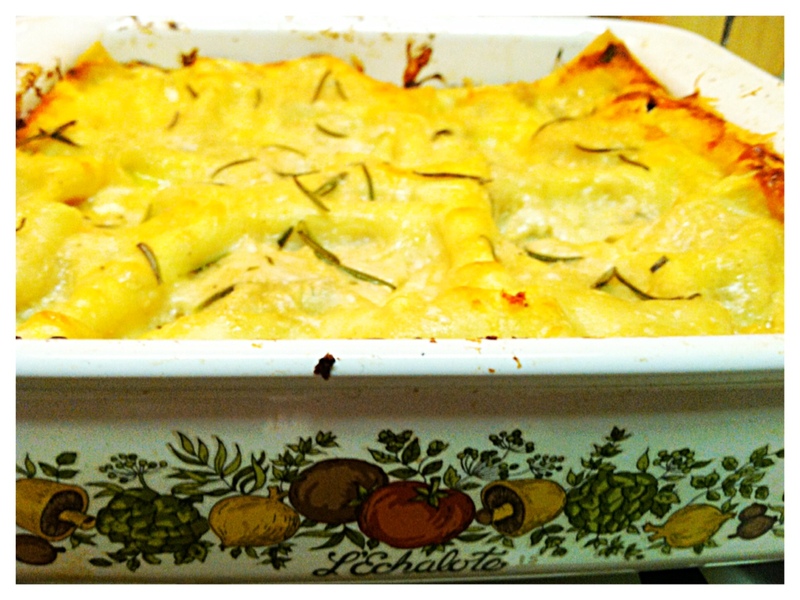 But with the crispy cheese topping and the ooey-gooey inside, this was still pretty darn delicious! Nothing beats a good mac and cheese, and the addition of white beans and skim milk instead of whole milk or cream makes this (almost) guilt-free! Anyway…I’ve wanted to make my own homemade pesto for some time now. I’ve been waiting until I had access to a food processor (which I do not own), until I realized that I could probably attempt this in my bullet blender. And while the final product isn’t perfect–there are some chunks and unground nuts here and there–it’s still pretty darn good! The other key component for homemade pesto was, obviously, basil. It’s hard to get my hands on fresh basil for some reason. They don’t sell it in regular bunches at the grocery store like they do parsley, cilantro and mint. It comes either as a big bunch with roots on the end in a package, which says to me that I’m meant to replant this. And since I have the gardening skills of a doorknob, I’ve always steered clear. But recently I discovered a much more user-friendly version: already potted basil! Yup, I just have to take it out of the package, plop it in a larger pot or on a dish (something to catch the dirt and water) and water it from time to time. And then tada! A never-ending supply of homegrown basil. I bought this wonderful creation yesterday, though it’s still sitting on my kitchen table because I’ve yet to transfer it to the big pot in my front yard. Well, now that my major two pieces of this puzzle came together, it seemed like there was nothing left to do but make pesto! This is a pretty traditional pesto, but not completely authentic. For one thing: I added parsley in with the basil to add a fresh, crisp brightness. There are also no pine nuts. (SAY WHAT?) Really. Pine nuts are expensive, and I’ve never exactly sat down with a bowl of pine nuts for a snack, so they’d really become quite a one-trick pony. So I substituted nuts I had sitting in my pantry: almonds. That’s the great thing about a sauce like pesto–you can tweak and customize to your tastes, dietary needs or pantry supplies! Also, like this is a surprise, I didn’t measure. I grabbed things and tossed them into the blender cup. And it was tasty. It was different each time too, but that’s the beauty of experimenting. Make this to your tastes. -Add everything to the cup of a bullet blender or jar of a regular blender. If using a food processor, add everything but the oil. Blend well, shaking and scraping down the sides as needed, until well incorporated and evenly chopped or puree to smooth, depending on personal preference. -Add more oil as needed, or, if using a food processor, drizzle in oil and the dry ingredients mix. Continue to blend to desired consistency. Finish with salt and pepper. I made my pesto pretty thick, almost paste-like, to be more versatile. I can add olive oil to it to thin it out for use as a sauce or keep it thick to use as a sandwich spread. So what did I make first with my homemade pesto? Pasta pesto, of course! 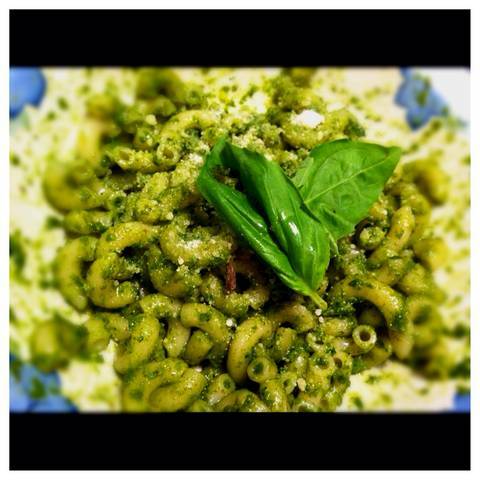 Cook pasta (I had elbow macaroni on hand), mix with olive oil and pesto, top with more grated Parmesan and enjoy! 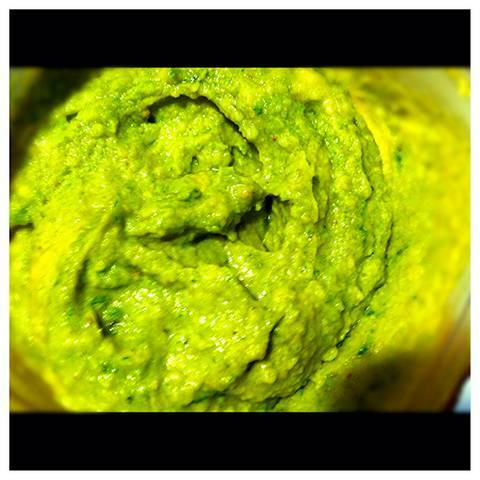 And for lunch the next day, I mixed a tablespoon or so of pesto into plain hummus to make pesto hummus! I used store-bought Sabra hummus, but this would be even better with homemade! Has anyone made their own pesto before? Do you go for the traditional recipe, or do you add your own tricks and tweaks? 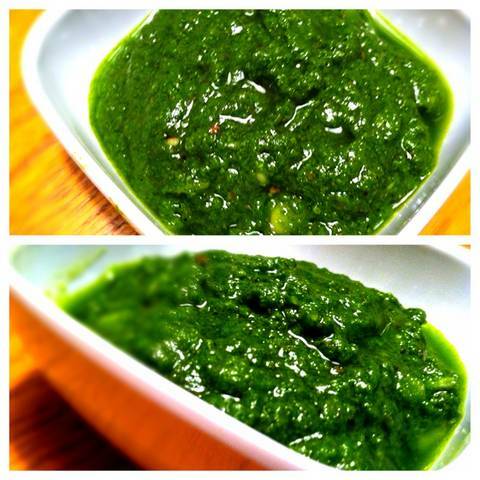 I’m seriously contemplating a cilantro pesto, since I have a cilantro obsession. What’s your favorite spin on pesto? First off, I’d like to apologize for the lag in posting. The last couple of weeks have been utterly crazy for me; I started up working full-time again, but didn’t quit my old job, plus I’m in the rehearsal process for a show that opens in three weeks. So I’m working 6-7 days a week and going to rehearsal, which unfortunately leaves little time to cook or enjoy a nice meal out. But Monday I had a half day at work, so Kevin and I took the opportunity–and free time–to go out for a nice, sit-down meal. He and I have this little thing we do where we try to go to a new restaurant every month. Monday was our February opportunity though, admittedly, we cheated on this one a bit. We chose to go to Porta in Asbury Park, N.J. It was brand new to him, but I had been there. Just once. And not for dinner. I just went there after work late one night with a friend and we split a pizza and a carafe of their house red wine (more on that later.) So really, I hadn’t experienced Porta to its fullest, so it was still fair. 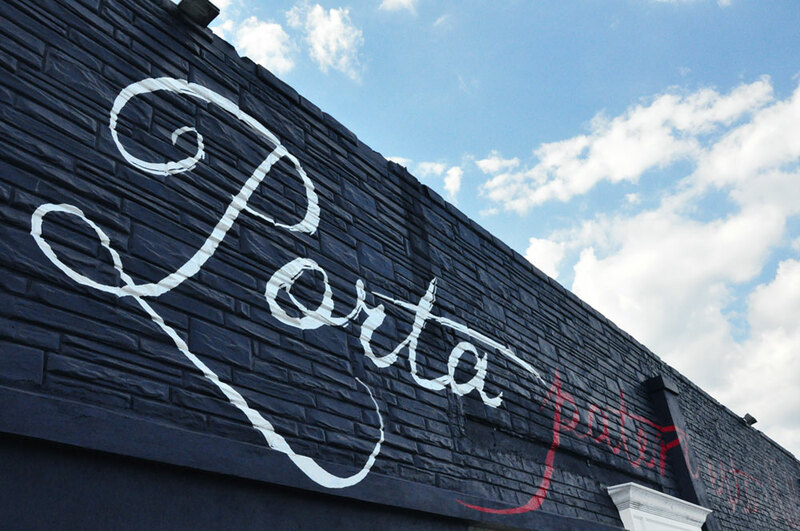 By night, Porta becomes a bar and nightclub complete with a DJ, live music and dancing. But by day (well, Monday evening), it had a unique, modern-classic feel, pumping standards through the sound system rather than Top 40 dance beats. It mixed sophistication with a backyard feel. But enough of that. Really, this is about the food. And the food is no less unique than the space itself. While the menu is small by normal standards, its anything but boring. Mostly appetizers and pizza with a few pasta options, Porta keeps it simple while keeping it special. 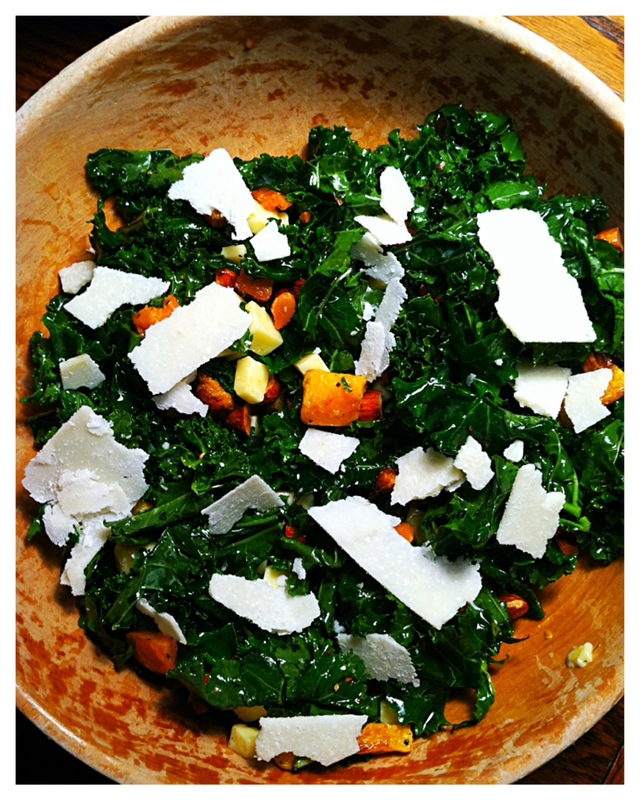 For appetizers, we ordered two salads to share: The Winter Caprazy and the Cavolo Nero. The Winter Caprazy is exactly what it sounds like: a seasonal take on the classic Caprese salad. This one included slow roasted tomatoes, black garlic and fresh oregano. Full disclosure: I’ve never had black garlic or fresh oregano (only dried.) I’ve been missing out. Black garlic, while it looks a bit scary, is a sweeter, richer cousin to what we know. And fresh oregano blows the dried stuff out of the water. Upon eating it, I got that distinctive bite and slight hit to the sinuses that confirmed I was indeed eating oregano, but the flavor was so much milder and fresher than its spice rack counterpart. Where has this been all my life? Needless to say, everything worked together pretty well, with the roasted tomatoes imparting a sweeter, heartier flavor than the raw version. I don’t love roasted tomatoes, but this definitely made a pretty good winter version of one of my favorite classic Italian salads. However, I don’t think the Winter Caprazy can hold a candle in creativity next to the Cavolo Nero. Tuscan kale, shaved sunchoke and watermelon radish with garlic crostini and parmigiano reggiano in a lemon-garlic dressing. This was my first introduction to kale, and what a way to start! 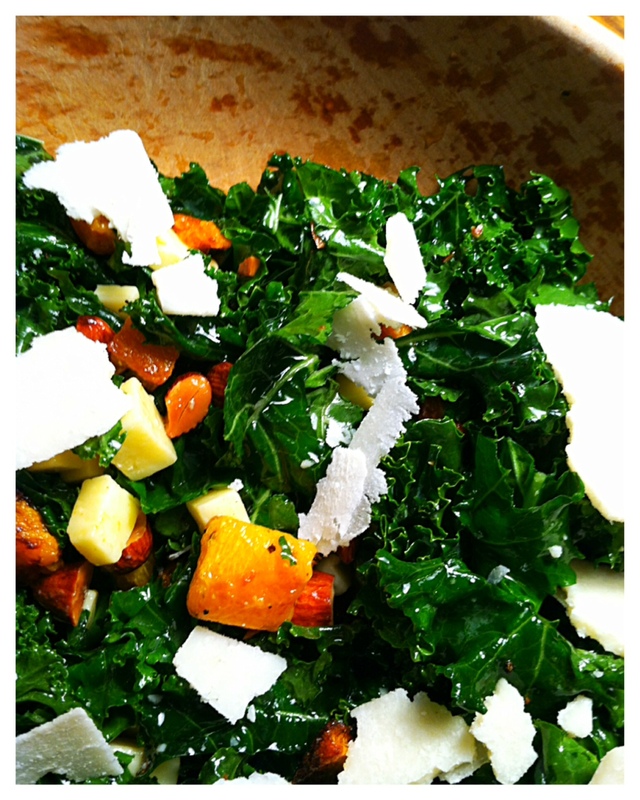 This definitely makes me want to eat kale more often. My only complaint about this salad would be that the toppings (sunchoke, watermelon radish, garlic croutons) were a bit too scarce. As good as the kale was, it was a bit boring without the accouterments and we left some on the plate once we finished everything else. But it was delicious. 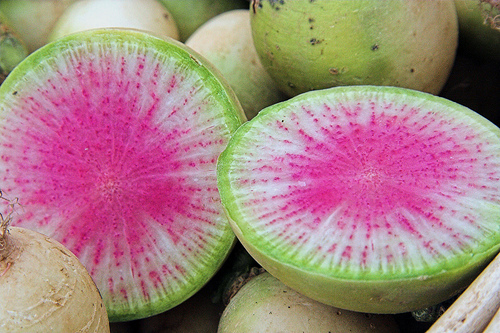 I love radishes, so this was a treat to me, especially with how beautiful shaved watermelon radishes are. As much as he loves pizza, Kevin hates blue cheese, but he bit the bullet and tried it on this pizza. And he didn’t hate it. Overall, he thought the pizza tasted great, but the generous drizzle of olive oil (and probably the grease from the sausage) made it a little soggy for his liking. He boxed half up to take home and said he’ll try to crisp it up in the oven before eating the leftovers. I was in a pasta kind of mood that night, so I went ahead and ordered off their small, but not limited pasta menu. I went a little off the beaten path with a wild boar ragu with rosemary papardelle, rosemary, sage, red wine and parmigiano reggiano. If you hadn’t told me this was wild boar, I wouldn’t have known. But I’m so glad I tried it. It’s, unsurprisingly, very similar to pork, but a bit heartier and beefier. Sort of like a delicious pork-beef hybrid all stewed up and served over pasta. Oh right, the pasta. Between the rosemary papardelle and the rosemary in the sauce, I expected a double whammy of in-your-face rosemary. But instead, it was subtle and underlying and I had to really look for it at times. Still, I ate almost the whole thing. Hearty, warm and inviting. It almost made me forget it was nearly 60 degrees that afternoon. Not the Italian Stallion, but another one of Porta'a pizzas. Photo courtesy of Porta Pizza. And of course, what better to complement a great meal than some house red wine? Porta has a nice Italian wine list, but the standout is their house-made red and white wines, which can be ordered by the glass or the carafe. I’ve been here twice and only ever had one wine–the house red, a Cabernet. I thought about switching it up at dinner, but I figured, “If it ain’t broke, don’t fix it.” Next time I’ll have to try their house white and eventually branch out to their other wine selections. Porta’s minimalistic atmosphere and inspired take on locally-sourced ingredients may be far too hip and trendy for some, but I actually found it a relaxing and enjoyable Monday evening. Is Porta a bit hipster? Yes. Are the food, drinks and service worth it despite that? Absolutely. 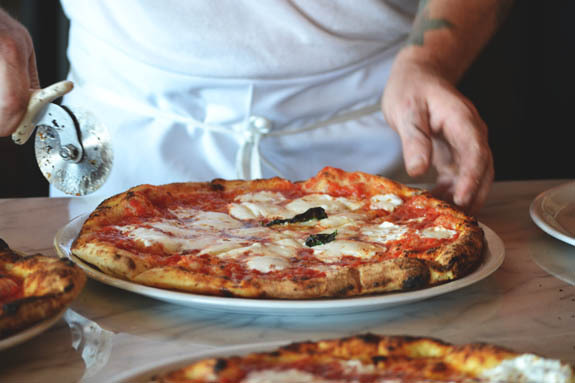 It’s nestled on an obscure little corner of Asbury Park, right between the bustling downtown and the boardwalk and offers a casual retreat that’s still leaps beyond traditional pizzeria fare. 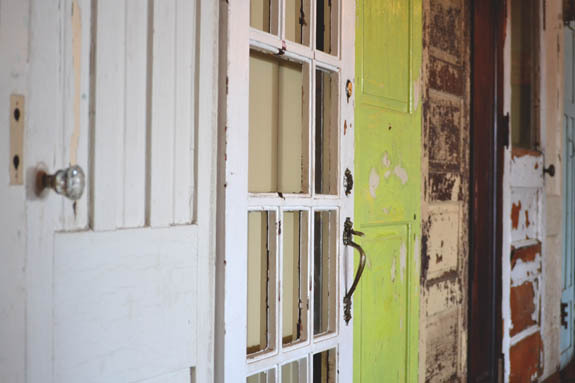 So, if you’re looking for an original, quality meal in a quaint, casual environment, head for Porta. Porta also runs several specials throughout the week, like gluten-free pizza every Tuesday and a 4-course family dinner every Sunday night. They weekend brunch every Saturday and Sunday and, of course, the club/bar scene at night. I’ll have to check out the nightlife sometime and see if it lives up to the weekday fare. Come summertime I’ll have to give this another go too, of course. Earlier this week, my boyfriend Kevin and I went to New York City and to the most glorious home of Italian food: Eataly NY. Eataly is not just a market and not just a restaurant; it is a combination of market, cooking school and 12 different eateries. 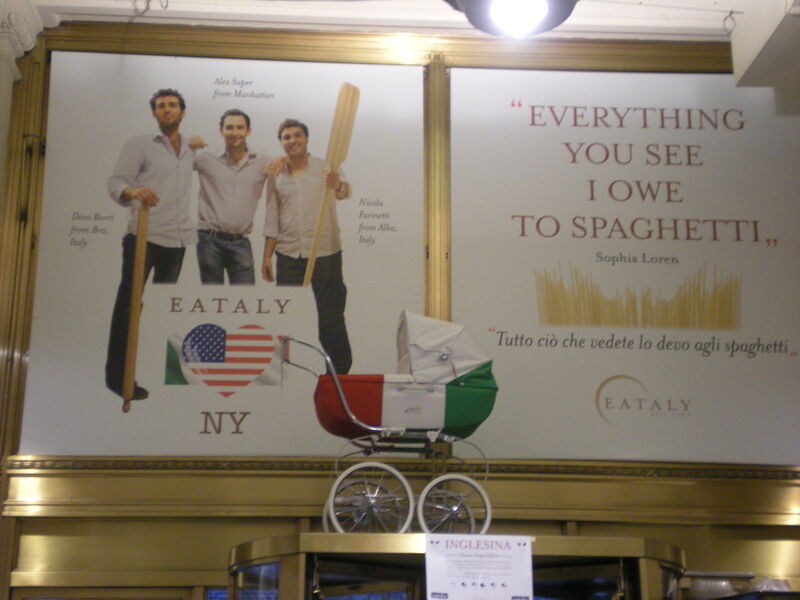 The collaborative project of Oscar Farinetti, Mario Batali and Lidia and Joe Bastianich, Eataly NY at 200 Fifth Ave. at 23rd St. is the only U.S. location of the culinary collective. 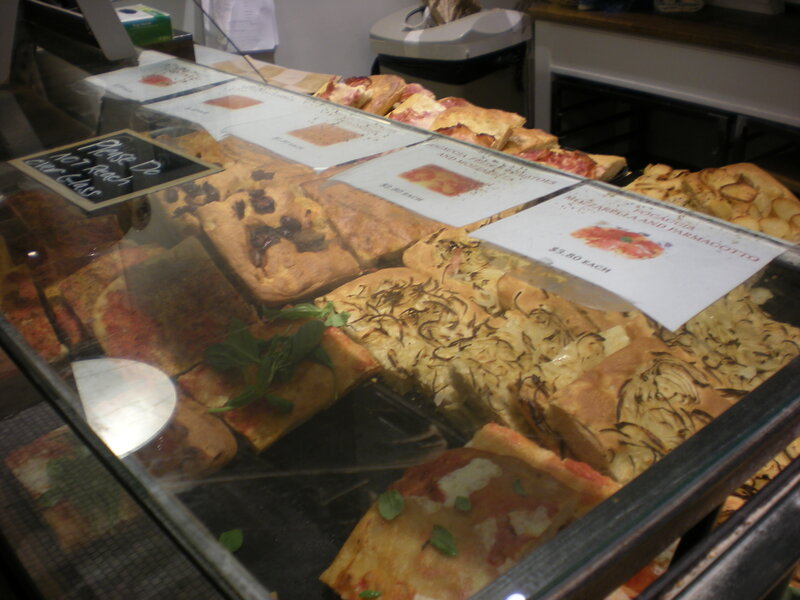 Before New York City, Eataly opened seven locations in Italy and six in Japan. Now, Eataly is not for the light of heart. This is not your average, run-of-the-mill market. 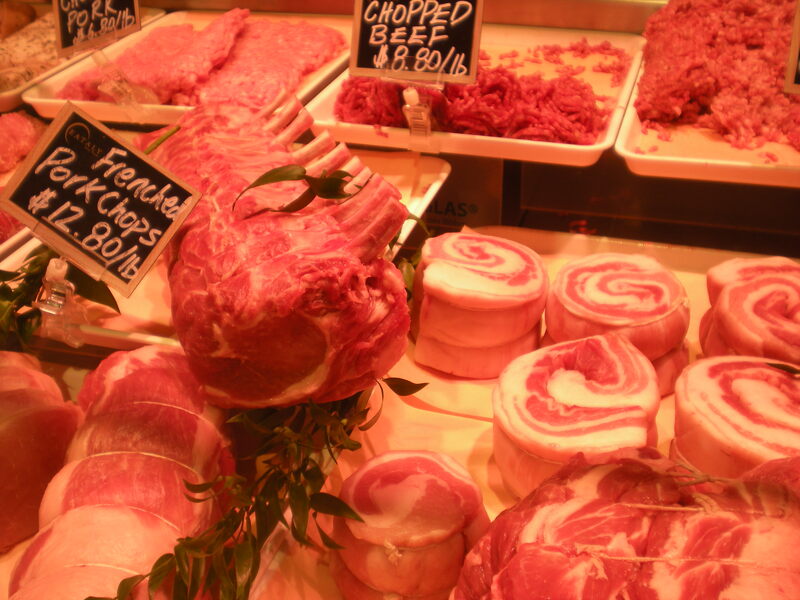 It’s massive, and encompasses everything from fresh exotic produces and full butcher counters to beer, wine and caviar. 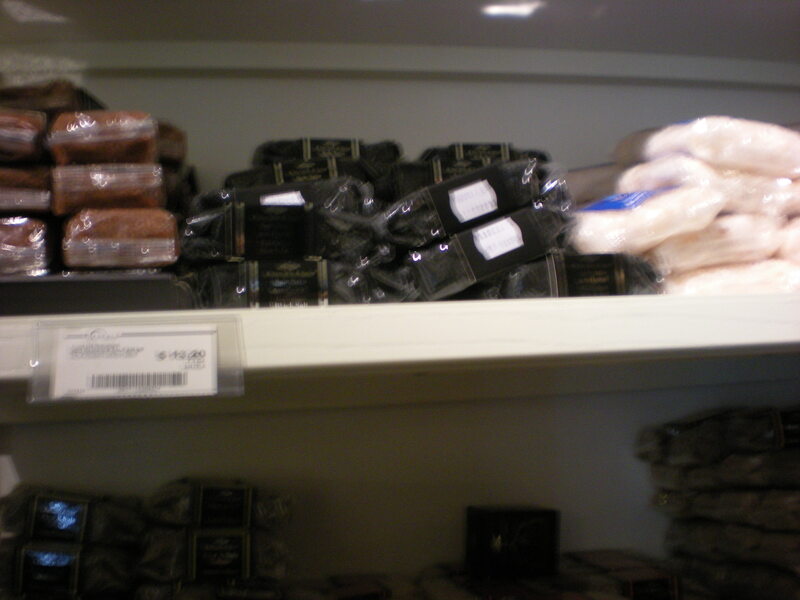 It has aisles upon aisles devoted to olive oils and pestos and balsamic vinegars behind lock and key. 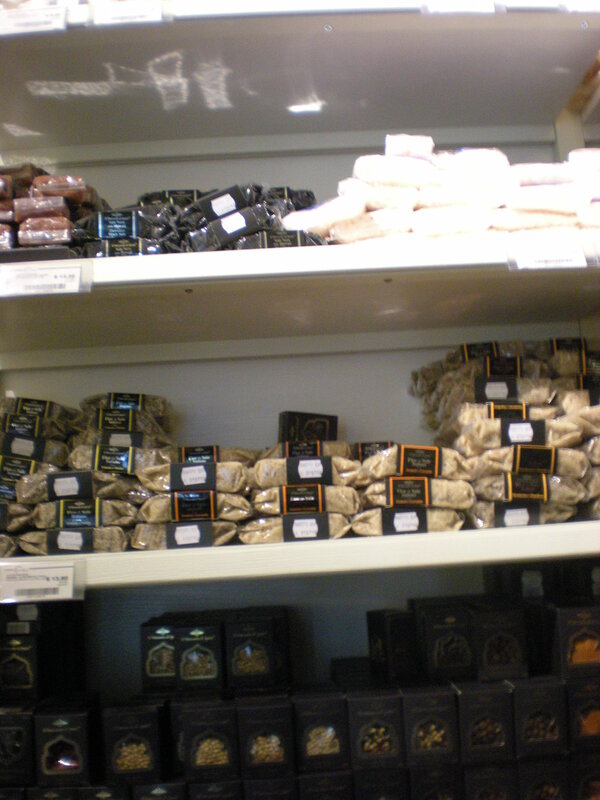 Shelves of spices from all over the world line the walls, surrounding bakery counters, fresh and dried pastas, and, of course, all those restaurants. Red, pink and black salts. Yes, a shelf just for salts, and there wasn't just one. Our dinner: Prosciutto di Parma, Prosciutto san Danielle, Mortadella, Prosciutto Cotto, Speck and Salami with Ricotta, Parmigiano Reggiano, Cacio Marzolino, Taleggic and Gorgonzola. Condiment plate of honey, figs and candied citrus peel. Yes, those restaurants. The various small eateries are interspersed throughout the space, each with its own niche of Italian cuisine. We stopped at La Piazza, a stand-up eatery right in the middle of the action. Literally, you stand at small, counter-like tables. The menu at La Piazza is antipasto-style, with mostly Italian meats and cheeses as well as selections of Italian wine and beer. As first-timers, we jumped right in with a meat and cheese sampler plate and a mozzarella classico with fresh basil.To complement, I had a lovely, medium-bodied glass Barbera d’ Albi and Kevin had an Italian golden ale. While we were both familiar with the traditional cured prosciuttos, the prosciutto cotto, or uncured prosciutto, was new to us. While it wasn’t awful, it wasn’t necessarily something I’d return for. It seemed a bit reminiscent of deli ham, nothing special. I think I’ll keep taking my prosciutto cured. The speck was the pleasant surprise of the night, though. Prosciutto is often compared to Spanish Serrano ham, though I think the speck is even more similar in flavor to the Serrano, but with a buttery, soft, melt-in-your mouth texture. It was like an elevated prosciutto. 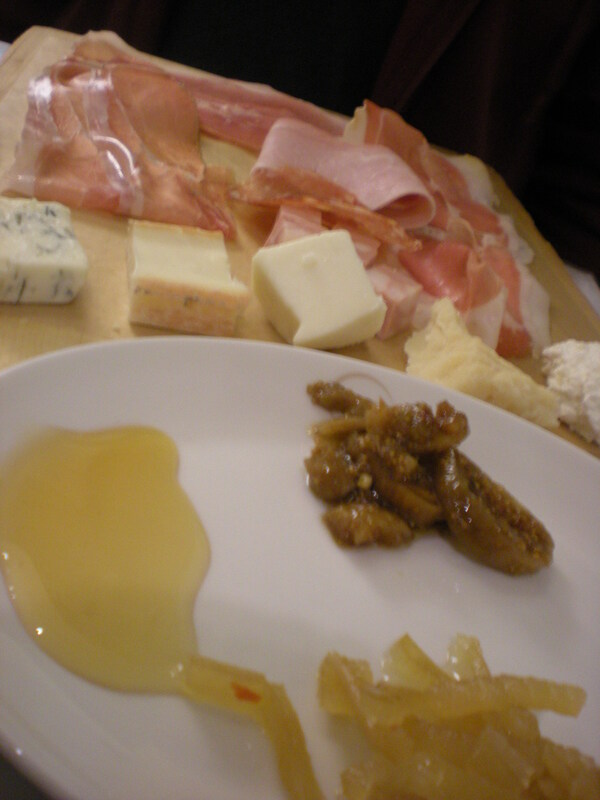 For the most part, we both loved everything on the meat plate, except the mortadella. (I’ve never been a fan of mortadella–it reminds me of boiled ham.) Otherwise, an exciting culinary journey. The cheeses were just as exciting. Parmigiano Reggiano, Ricotta and Gorgonzola were familiar, but I was new to the Cacio and Taleggic. I’m a big fan of the first three, particularly Gorgonzola, which paired deliciously with the figs and candied citrus peels from the condiment plate. The Taleggic, a semi-soft cow’s milk cheese, reminded me of a milder Brie. I enjoy Brie, but I generally find the rind too bitter and pungent, and too much can be overpowering. With the Taleggic, I ate it rind and all, and found the milder flavor welcoming. This too, like Brie, paired quite well with the sweet accoutrements. The Cacio Marzolino, a sheep’s milk cheese, had a nutty flavor, slightly reminiscent of a softer Parmesan. 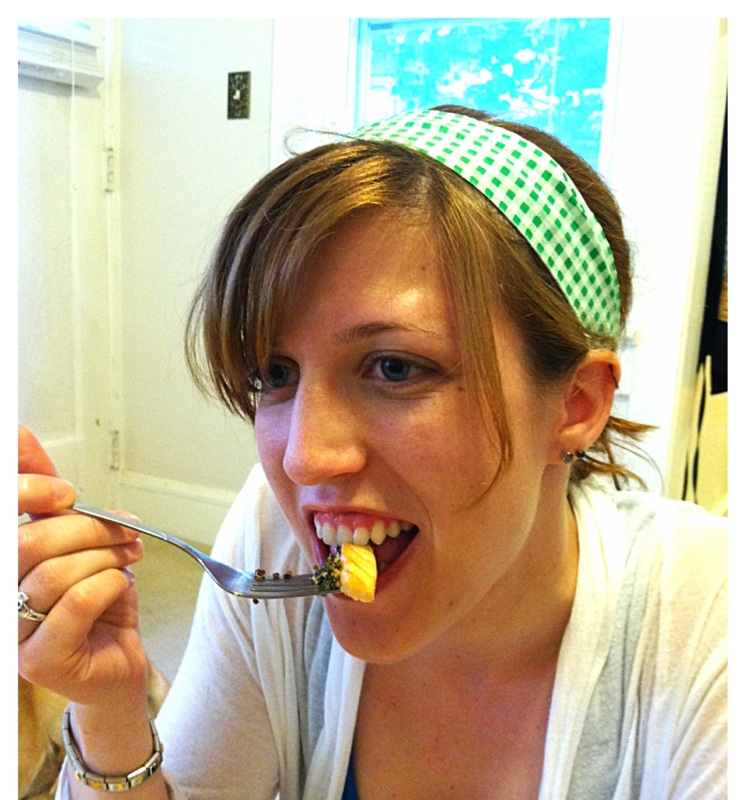 However, it was my least favorite of the cheeses and the only one we left unfinished. 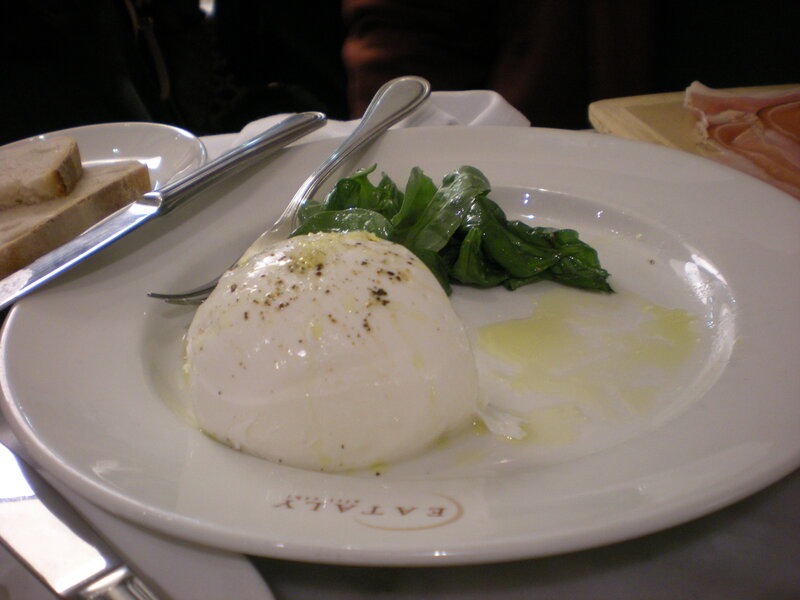 We are both longtime fans of mozzarella, so naturally, we enjoyed the classico thoroughly. Sometimes, I’m very easy to please: the freshest, most delicious mozzarella and fresh, snappy basil make me a very happy person. Add a glass of red wine (check) and I’m perfect. My initial hope was that we would hop around from eatery to eatery, sampling some of the best Italy has to offer, but we filled up too much on meat, cheese, wine and beer. But, of course, we did leave room for dessert. Eataly houses all of its sweets, espressos and cheeses together, and we wasted no time exploring what may have been my favorite part of the store. 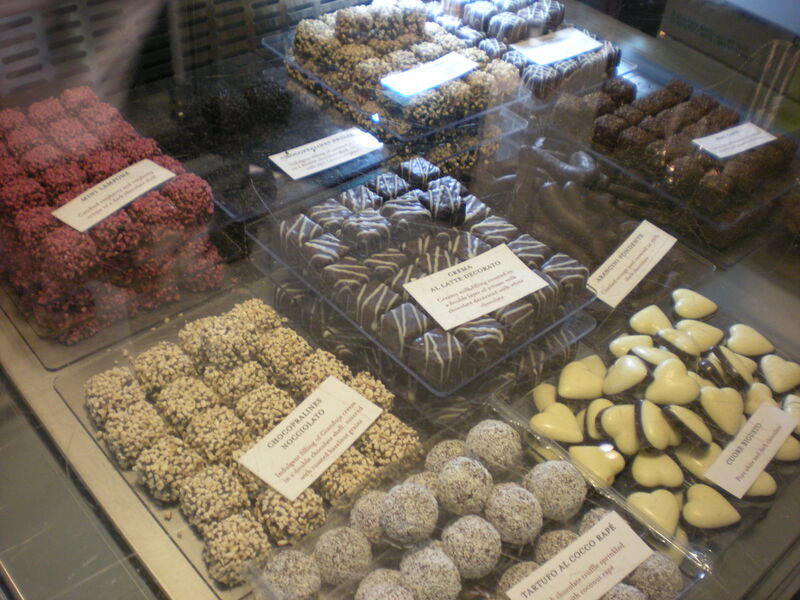 In addition to freshly ground espresso, marscapone cheese and fruit preserves were several counters of delectable pastries, colorful chocolates and creamy gelato. 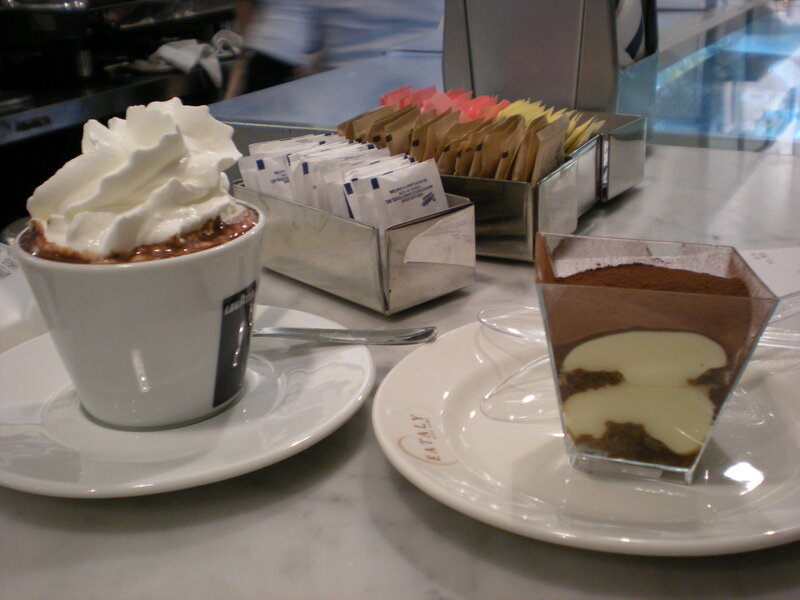 Kevin got his favorite–tiramisu–and a rich Italian hot chocolate. But, this is no Swiss Miss. It is thick, rich and velvety, more like melted chocolate with a touch of milk than chocolate-flavored milk. The ever-so-slight bitterness of the dark chocolate prevented the hot chocolate from becoming overwhelmingly sweet. With our stomachs filled and our taste buds satisfied, we returned to our browsing. It’s pretty much impossible to walk out of a place like this empty-handed, but since we did have a whole train ride back to New Jersey to deal with, we limited ourselves to one loaf of bread each. We each went for a soft and crusty rustic bread, Kevin an Italian rye and me a raisin. I still have about half the loaf left. The tangy sourdough flavor and the sweet raisins have made for some delicious breakfasts. 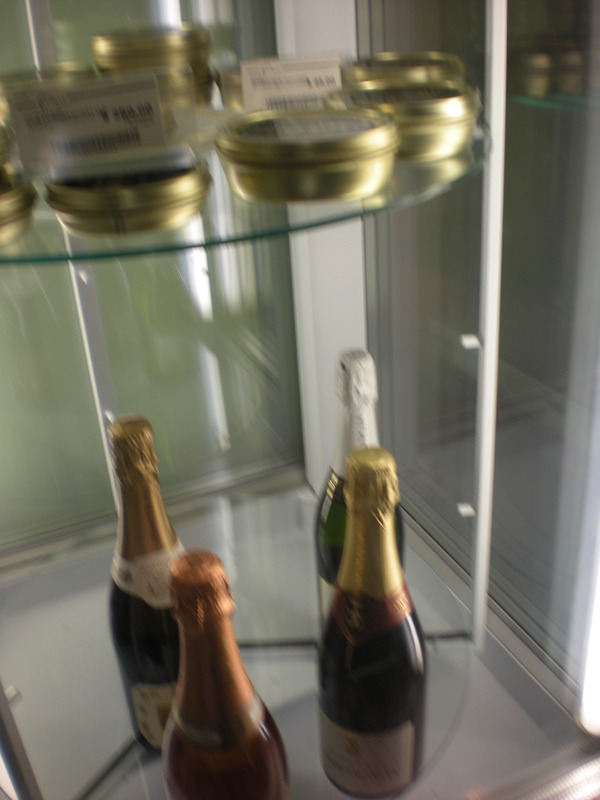 In addition to the main space, there is also an entire separate wine shop next door. I went to seek out a bottle of the Barbera d’Albi I drank with dinner, but sadly, they were out. Otherwise I would have had one more purchase to add to my list. 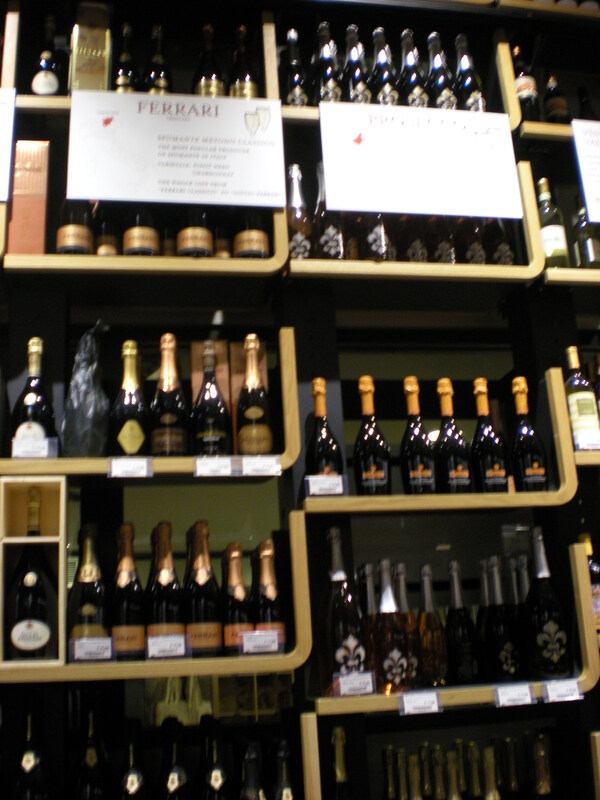 All in all, Eataly was a fantastic experience. But, I barely scratched the surface of what it has to offer, so I’ll just have to return. It’s produce-driven eatery, Le Verdure, tops my list of must-trys, as does its aplty-named La Pasta and La Pizza. Perhaps one of the most intriguing draws of Eataly is its rooftop restaurant, Birreria. 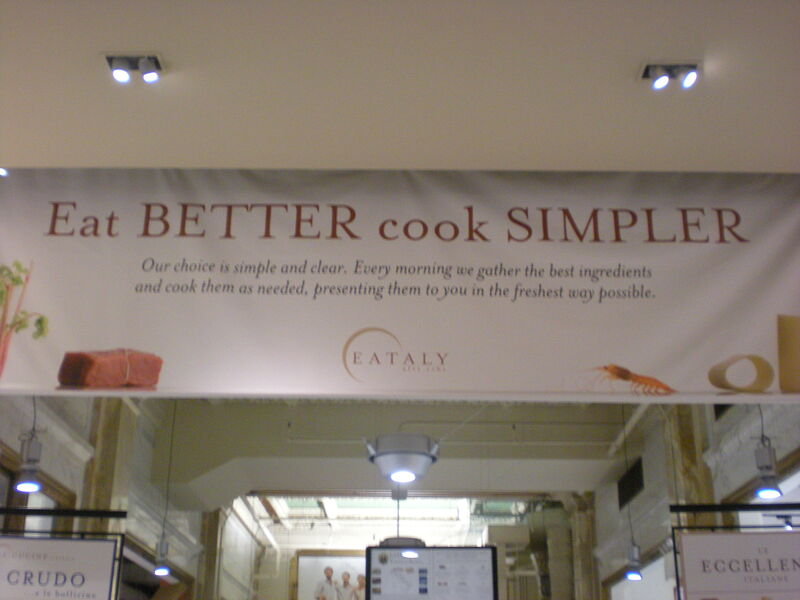 But one of the best things about Eataly is probably its mission: Eat Better, Cook Simpler. They work on the practice of cooking what they sell and selling what they cook, with a real focus in high-quality, natural ingredients. However, they don’t do it without a bit of cheekiness. Their “policy” states that 1. The customer is not always right. 2. Eataly is not always right. 3. Through our differences, we create harmony. If you’re ever in New York City (or not, but want to–and should–be) and love all things Italian, head over to Fifth Ave. and immerse yourself in the culinary haven that is Eataly. I promise, you won’t be disappointed as it quite literally has something for everyone. 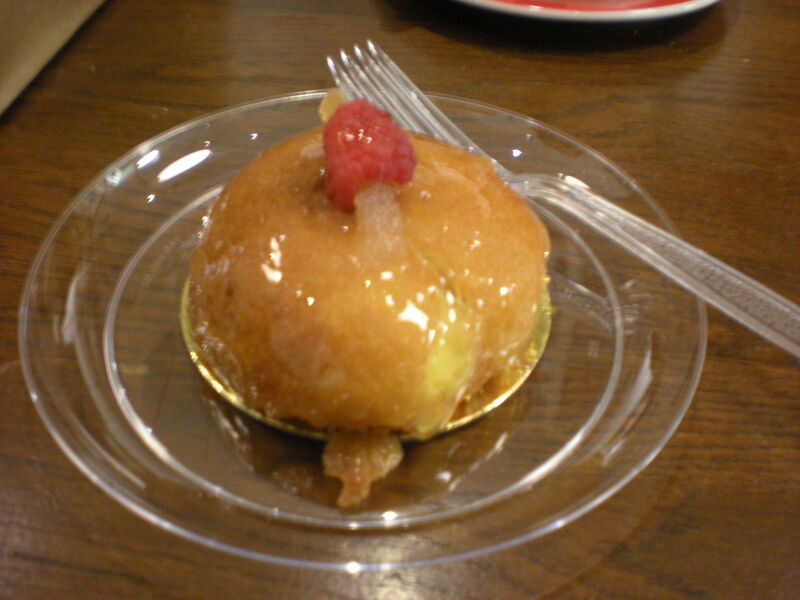 Oh, and if you do find yourself there, please, let me know what you thought of it, what you did, what you ate, etc.! I’d love to hear about other people’s experiences there.